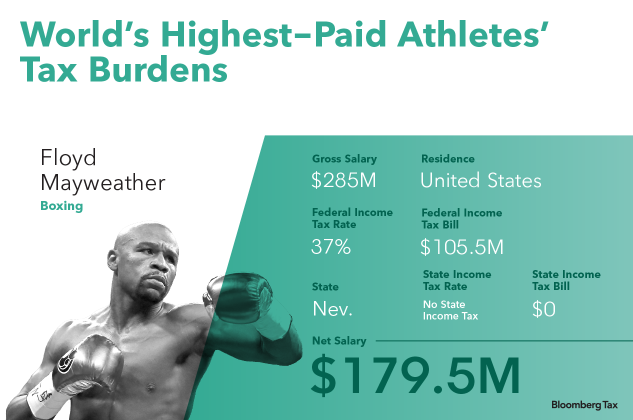 The world’s 10 highest-paid athletes collectively made over a billion dollars in the past year, but taxes—depending on where the sports stars live—can eat up a majority of their income. Floyd Mayweather firmly grasps the top spot, netting more than the next two athletes combined. Mayweather doesn’t have to pay state income tax because he resides in Nevada, which doesn’t impose an individual income tax. Conor McGregor, who competed against Mayweather in a historic August 2017 fight, has residence in both the U.S.—where the top federal income tax bracket is 37 percent—and Ireland—which has a top income tax rate of 40 percent, according to Bloomberg Tax data. McGregor also lives in Nevada. LeBron James, who is often called the greatest basketball player of all time, is the second-highest-paid American on the list and the first to pay state income tax. Ohio’s tax rate is 4.997 percent. Tennis legend Roger Federer could pay the lowest tax rate among the top five, depending on which Swiss municipality he resides in. Swiss rates vary from 21.6 percent to 46.2 percent. Federer has the opportunity to net a higher percentage of his salary than anyone else in the top 10. The final three athletes, all American, also must pay state income taxes, which range from the 4.25 percent that quarterback Matthew Stafford pays in Michigan to the the 13.3 percent—the highest in the country—that three-time NBA Champion Stephen Curry pays in California. Athletes ranked two, three, and five on the list are international soccer players all competing in the 2018 FIFA World Cup in Russia. The highest paid is Lionel Messi, who faces a 35 percent rate in Argentina. Cristiano Ronaldo, the Portuguese soccer superstar, faces the highest tax rate of any of the athletes at 48 percent. Brazilian soccer phenom Neymar is subject to one of the lowest tax rates among the top 10 at 27.5 percent. The jock tax is calculated by taking the amount of time a player spends in another state and dividing it by the total amount of income-related work days, which start at the beginning of training camp. States with a sports franchise that don’t administer an income tax—Florida, Washington, Nevada, Tennessee, and Texas—don’t collect a jock tax. Players receive a tax credit from their home state on jock tax totals to avoid double taxation. Duty days accumulated during a sport league’s postseason count toward next season’s yearly total. Players are also subject to agent fees, which average around 3 percent of a player’s salary, according to Sean K. Packard, tax director at Octagon Financial Services in Virginia. High-income individuals making more than $200,000 are subject to a 0.9 percent Medicare surplus tax.